“My skills as a designer, facilitator, storyteller, reporter, teacher have all led me to what I'm doing now. I'm exploring India, looking for inspiring stories, and sharing them. I use the motorcycle as a medium, I am a RiderReporter,” says Mr. Arvind Prabhakar. Trained as a Designer, he ran a successful design firm for 8 years. While these years, he has played active role in numerous social projects along with citizen initiative projects like Smart vote, Corruption Saaku, BPAC, including being part of the board of some committed NGOs. He has worked with communities, schools and individuals on sustainability and environment related themes. “I started a motorcycle community two years ago called IndusRider, which is a sort of a mash up of a motorcycle tour firm + a citizen volunteer network + independent reporting group,” he narrates. Arvind started riding motorcycles at a very early age. Being a student of Army School, he was nurtured in his skills involving sports, adventure, nature clubs from the school days. ”Even at home, my folks made sure we did at least two road trips a year. We would drive off to places for holidays for 3 to 4 days. Being on the road had become something of a tradition in our family. It had a big influence on my brother and myself,” he laughs. As a consequence, Arvind’s younger brother works for OverDrive as the Road Test Editor. Arvind, while in the design school, was fortunate to meet Mr. Rajen Joshua, a pioneer motorcycle racer from the 80’s. Mr.Joshua’s guidance and mentoring helped him get a well-rounded understanding of motorcycles. Along the way came other very prominent people from the same world and this kick-started Arvind’s love for two wheels and that turned into a personal expression of freedom and became an inseparable part of his life. In 2011, the idea of getting into motorcycling, more seriously, ignited in Arvind. IndusRider is not just a motorcycle tour company. At IndusRider, the riders look to create meaningful linkages between communities and the outside world. “All our rides and experiences that we offer have a strong social or environmental focus. We support organisations that are already doing inspiring ground work and work alongside them to see how best to integrate motorcycling related activities that can benefit and help further the cause that they are already a part of,” mentions Mr. Prabhakar. IndusRider is interested in exploring the zone that forms the intersection of motorcycle and life. IndusRider is currently growing its chapters in Bangalore, Goa and Dehradun, and evolving its approach and work. Arvind and his team already are working alongside wildlife conservation groups, like Mhadei Research Center, Wild Otter and others as conservation partners and helping in outreach, awareness and citizen science initiatives in the Western Ghats around Goa. On talking about his most amazing and memorable experiences of roadtrips, he recalls and says, “The 5 mountain ride in Malaysia was one really amazing motorcycle adventure. We covered over 2000 kms and explored the 5 highest points in Malaysia on some really amazing motorcycles. 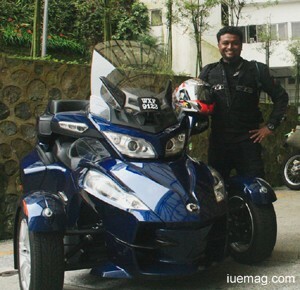 One really interesting motorcycle was the Can-Am Spyder, a 1200 cc Trike (a three wheeled motorcycle) the tropical forests of Malaysia are some of the oldest rainforests in the world. Here we got to meet the local forest tribes, the “Orang Asli”. I got to learn how to use their blow darts and we trekked into these rainforests to experience, in my opinion, one of the thickest and richest rainforests in the world; a truly amazing adventure,” with a smile. Arvind has also been an avid photographer and on talking about the places where he found extreme level of beauty to be captured, he says, “It has to be the mighty Himalayas, I’ve spent a lot of time taking pictures in this region and I don’t think I will ever get tired. The everchanging landscape forces you to ride slow and stop often to take pictures. It will never stop being overwhelming; I think others who have been there will agree.” It is through photography that one can capture moments that can tell a thousand words and Arvind finds himself looking through the camera every time he finds an inspiration.